Knowing that general/introductory economics is often the only economics course many students will ever take, this esteemed author team endeavors to connect students to economics through the world around them. Explorations in Economics introduces high school students to the here-and-now of economic ideas and applications, involving the students in the active exploration of the economic principles that will drive their decision-making as consumers, workers, and citizens. 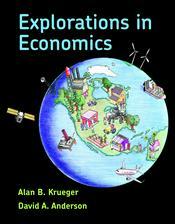 With every copy of Explorations in Economics, you will also receive a copy of Favorite Ways to Explore Economics absolutely free! Favorite Ways to Explore Economics brings economics to life through structured experiments that students perform in groups and individually. Problem sets and active learning exercises are correlated to chapters and modules in Explorations in Economics to ensure your students have many opportunities to discover how relevant, engaging, and fun economics can be!